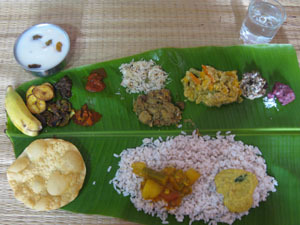 Today I have a Bengali special dish – Ghonto. Ghonto is a mixed vegetable dish that can be prepared with different kinds of vegetables like potato, carrot, green beans, spinach, cabbage, bottle gourd, ridge gourd, snake gourd etc. The mixed vegetable ghonto that I tasted at my friend Zahera‘s place tasted a bit similar to my mixed vegetable subzi recipe, which is one of my favorite vegetable dishes. She told me that I can make this ghonto with shrimp or fish head to make it taste even better. Muri ghonto, the most popular ghonto dish is prepared with head of Fish (mostly rohu ) together with vegetables. It is usually had with plain rice. Since I have never cooked with fish head before, I decided to give it a try with shrimp. Shrimp goes well with most of the vegetables and makes the dish extra tasty and flavorful. Since this dish has loads of vegetables, you don’t need any other side-dish except a dal or a yoghurt curry. Its very easy to prepare and all the ingredients will surely be available in an Indian kitchen. Try this awesome dish, and do let me know how you liked it! You can also use other vegetables such as spinach, cabbage, bottle gourd, ridge gourd, snake gourd etc. Avoid using bitter gourd,okra, parwal and capsicum. 1. Combine cleaned shrimp with the other ingredients numbered 1. Set aside for 10 minutes. 2. Heat 2- 3 tbsp oil in a kadai/ any pan. Fry shrimp in 2 batches until it turns white and curls up, about 1 minute. Remove to a plate. 3. In the remaining oil, fry fenugreek seeds until golden. Next add chopped vegetables and all the ingredients numbered 4. Mix well. Sprinkle little water and cook everything for 5 – 6 minutes stirring occasionally until the raw smell is gone. Taste-check for salt. Add shrimp, 1/4 – 1/2 cup water and green peas, if using. Mix well. Cover and cook for 7 – 8 minutes at medium-low heat, stirring once in between. Add 1/2 tsp ghee and 2 tbsp chopped cilantro. Mix well and switch off. It goes well with rice and chapathis and tastes even better the next day. We had it with rice and bhindi kadhi. Hope you enjoy this!